Angel Falls is located in Lake Rabun Georgia and is actually a series of two waterfalls . . . Angel Falls and Angel Panther Falls. To access the trail, travel along Lake Rabun Road in Lakemont. You can park in the Lake Rabun Campground. This is a seasonal campground so if it’s closed, there are a few spots on the side of the road across from Tame Turkey Road or you can park down at Lake Rabun Beach Recreation Area and make the short walk back up to the trail. 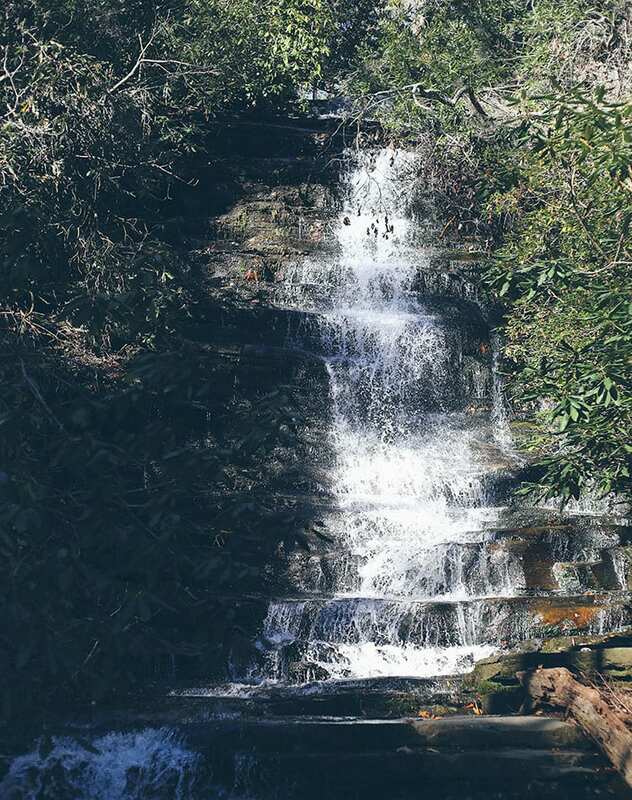 The waterfalls are located on a relatively short 1.7 mile round trip hike. There is very little incline or elevation climb on the entire hike and is more than doable for young children. If they are younger than 2 years old, they’ll probably need to be carried for a stretch. But all in all, this is an all ages hike any time of the year. At less than a mile there and a mile back, this is the perfect distance in which to kill a short amount of time. We went on the weekend, out of season (late Fall) and we only passed one small group on the hike. We would imagine that during the summer that it probably gets crowded with people looking for a break from the lake or those who are riding through on the scenic Lake Rabun drive. One cool spot on the way up is on the left hand side. There is a sign marking the spot but it’s a man made stone structure that people used to use for refrigeration for things like eggs and milk back in the early 1900s. The one category that we dinged it for was The Options for Exploring. 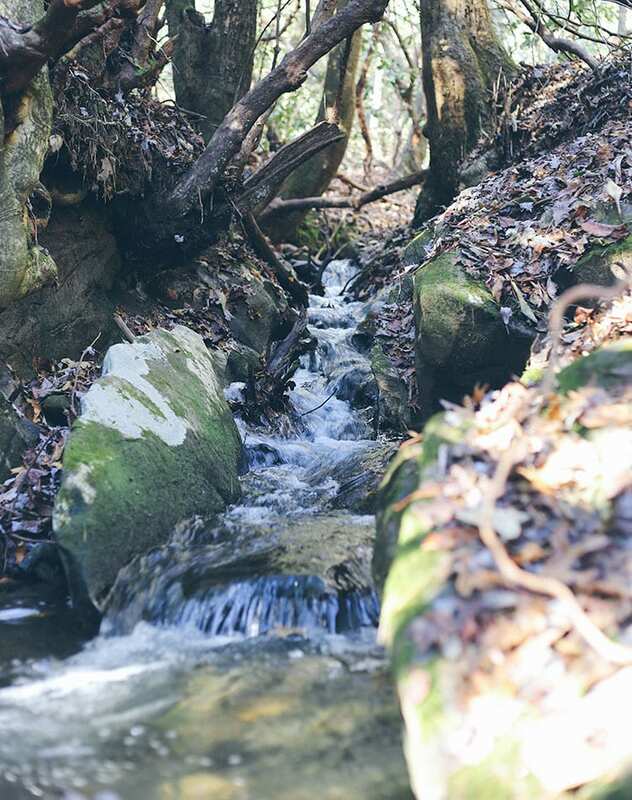 When we take hikes, and in particular hikes to waterfalls, we love having the ability to jump off and do some exploring on side trails or to get out and go swimming in spots. Because this trail was so short and compact and the stream flowing down so narrow and shallow, there weren’t many options for us to get out and play. The base of the falls is only a few inches deep which would be perfect if you wanted a safe place for the kids to play. But other than that it was a pretty straight shot on the trail and back with not many options for getting sidetracked or lost if that’s your sort of thing. The view was pretty solid as well. Not the best we’ve seen in North Georgia and certainly not the worst. The waterfalls are actually two separate falls. At the bottom is Angel Panther Falls. There is a small bench here for sitting. You can follow the trails up just a bit more from here and you will find a viewing deck for the upper Angel Falls. They’re both pretty and true to Georgia’s diverse seasons, can look and feel different throughout the year. The bottom falls have some really interesting moss and green root growth on the far right side across the stream which is insanely interesting. We’re not botanists so don’t laugh, but they reminded us of a type of sea anemone.